The 2018 Northeast Ag Expo, which is a joint effort of the N.C. Cooperative Extension Centers of Camden, Chowan, Currituck, Gates, Pasquotank, and Perquimans counties, farmers, agribusinesses, and commodity associations, was hosted by the Pasquotank County Center of the N.C. Cooperative Extension along with NC Spuds Inc. and Perdue Agribusiness of Elizabeth City. This field day highlighted cutting-edge field research for soybean and had a trade show with 35 businesses connected with/serving agriculture. Based on results of an evaluation administered at the conclusion of the field day, as well as other participant information, it was found that this field day impacted participants in a number of positive ways. When the participants were asked, “Have you benefited from previous field days that provided information on soybean production?”, they indicated that they had collectively increased their revenues by $2.5 million. For many of the topics covered at the field day, over 30% of the participants said that they would adopt the practices. For additional information about the impacts of the field day, download the complete impact report. The Northeast Ag Expo Team conducts two field days each year with one being a small grain field day in late winter and the other being the 4th Thursday in July. For more information about what the Northeast Ag Expo is providing for the growers of northeast NC, see the Northeast Ag Expo website. Trams transporting participants of the 2018 NE Ag Expo Field Day to stops highlighting cutting-edge soybean field research hosted by the Pasquotank Extension Center of the N.C. Cooperative Extension along with NC Spuds Inc. and Perdue Agribusiness of Elizabeth City. 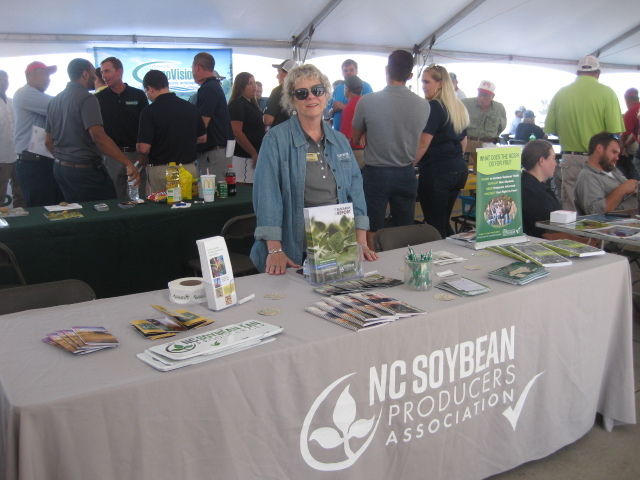 The NC Soybean Producers Association along with 34 other businesses exhibited at the 2018 Northeast Ag Expo. Participants get to meet with the representatives of these businesses and learn about the products/services they provide.